What’s A Zhu Zhu Pet And Why Do Kids Want Them? I went out this weekend with some friends. I bummed around, saw Ninja Assassin, and then we all went out for Mexican food at a local eatery. On the drive in, I saw that one of the other food places (a Mr. Gatti’s) in the shopping center was advertising some kind of give-away. The object they were offering was something called a Zhu Zhu Pet (warning, video autoplays). Apparently, that’s this year’s hot toy trend, joining the likes of Tickle Me Elmo and Cabbage Patch Dolls in the long pantheon of inexplicable cultural phenomenon. 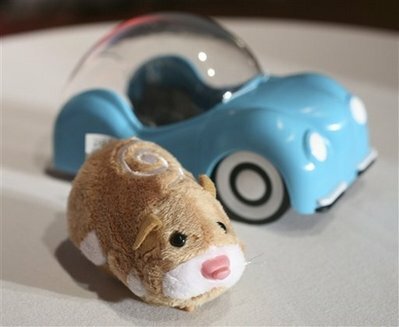 Apparently, a Zhu Zhu pet is a little hamster that can drive a car and that runs around squeaking randomly. The toys are the brainchild of veteran designer Russ Hornsby and St. Louis company Cepia Inc. This six-year-old company is looking at sales of $100 million in Zhu Zhu Pets alone, with an estimated $300-$400 million by this time next year. All for what is basically a $10 cat toy with a bubble car. Tags: toys, hot toys, toy trends, must-have toys, zhu zhu pets, robotic hamsters, toy hamsters, strange toys, trends, Russ Hornsby, Cepia Inc.